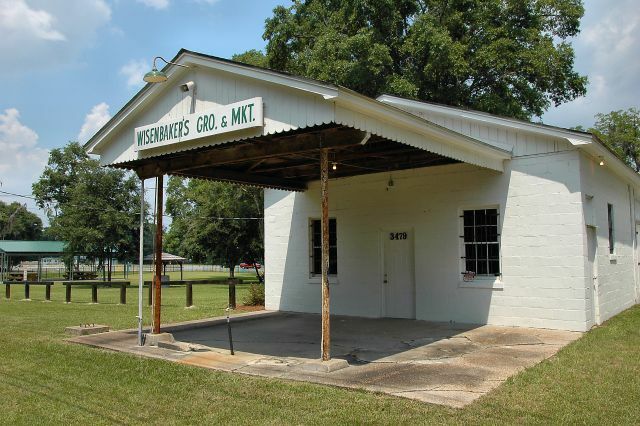 This is now home to the Dasher Museum. 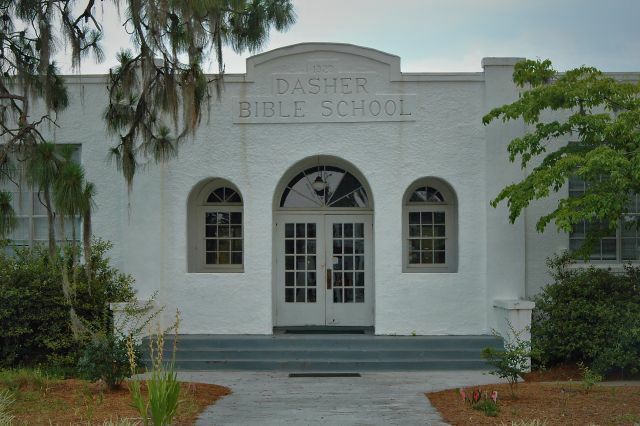 The Dasher Bible School was established in 1914 and this facility constructed in 1928. It is still used today, as the Georgia Christian School. This historical background appeared in a 2014 edition of the Valdosta Daily Times, when the school was celebrating its centennial: O.P. Copeland, P.W. McLeod, and W.J. Copeland led a petition drive to the Lowndes County school board in summer 1914. They wished to consolidate the Dasher and Union public schools then hold classes in the Dasher Church of Christ. They succeeded and held classes at the meetinghouse on Dasher’s Carol Ulmer Road. Willis H. Allen and Molly Powell led the school’s first classes. They separated lower and upper grades with a curtain strung across the room. To keep with public school rules, Allen taught Bible classes after the regular school day. Children did not have to stay for Bible classes though most did. After this one year, the consolidation ended. O.P. Copeland, P.W. McLeod, and W.J. Copeland were named as the board of trustees, a school board was selected, and they named the new institution Dasher Bible School. Richard Wisenbaker donated land between the railroad and U.S. 41 South. In 1915, the school was built upon this land, the same land where Dasher Bible School by the mid-20th century became Georgia Christian School. I’m unsure why the building has a date of 1928 over the entrance, but it’s likely the school was expanded or remodeled around that time.